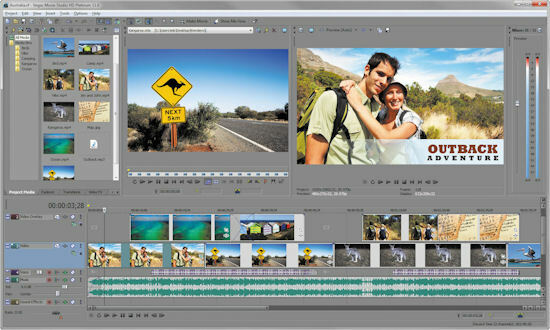 Sony Creative Software continues to enhance its collection of consumer media editing tools with Sony Vegas Movie Studio HD Platinum 11 for "professional-quality" video editing and disc authoring, at a consumer price just below $100. This new version features end-to-end support for stereoscopic 3D editing, along with enhancements including GPU-accelerated AVC rendering and the Blu-ray and DVD authoring in the separate DVD Architect Studio 5.0. This splitting of functionality into separate focused applications is a trademark of the Sony venerable Home Studio line, which also includes two other separate audio tools, focused on audio vs. music (see earlier post): Sound Forge Audio Studio 10 for audio editing and production ($64, see earlier post) and ACID Music Studio 8 for music creation and mixing ($64). Vegas Movie Studio is designed for people who want to do significant editing -- It's not an "EZ" editor with lots of one-click fixes and step-by-step wizards. Instead, it's a pro-style editor, with timeline editing, keyframed video effects and transitions, text animations and effects, and audio effects down to the event level. Plus it incorporates pro technology including stabilization, green screen, color correction, and support for pro cameras including DVCAM. Another Sony trademark is deep access to options and features, with a wide range of options and features available in the menus and dialogs. The profusion can sometimes be overwhelming, especially with Sony's sometimes idiosyncratic design and terminology. But Vegas Movie Studio continues to satisfy if you're looking for a consumer-priced editing tool that will keep offering options instead of getting in your way as you fine tune the subtle details of your production. The core Vegas Movie Studio HD Platinum 11 is priced at $94.95, with AVCHD video, 5.1 sound, and DVD Architect Studio. And the Vegas Movie Studio HD Platinum 11 Production Suite for $124.95 bundles Sound Forge Audio Studio and more effects. Samson Zoom H1 Handy Recorder is a small and light and relatively inexpensive professional handheld audio recorder with a smart design that makes just the right trade-offs -- at least for my needs. At around 5 1/4 inches long and 1 ounce, it's easy to carry for capturing events, and it's lightweight enough to attach to a camera (with a tripod mount, plus a line out jack to feed directly into the camera audio input). But the key to the H1 is the ease of use -- It has the controls and options that you need, all implemented with physical buttons and switches. You can set and check the settings directly, without needing to page through menus to make sure you don't have some options messed up. The H1 records in high quality in WAV (PCM uncompressed) format at 44.1 / 48 / 96 kHz at 16-bit or 24-bit, or use MP3 for longer recording time at 44.1 / 48 kHz, from 48 to 320 kbps. The audio files are saved to a removable microSD memory card. A 2 GB card is included, or you can go up to a 32 GB microSDHC card (around $50) for over 50 hours of recording at 16-bit / 44.1 kHz WAV, or 555 hours in 128 kbps MP3 format. There's also a mini-USB port to transfer files, and also to power the unit externally. The result is a nice compact package that's quite light, but doesn't seem cheap or less durable. The straightforward controls let you set up the recording the way you want, confirm the set-up by visually checking the switch positions, and then monitor the live recording status and levels on the LCD display. Even better, the Zoom H1 Recorder is priced around $99. Also check out the Zoom H1 Accessory Pak for around $20 that includes a nice compact and secure padded-shell case, windscreen, adjustable tripod table stand, mic clip adapter, and USB AC adapter and cable. See my Audio Accessories Gallery for more on audio components. Entries posted to Manifest Tech Blog in August 2011, listed from oldest to newest.